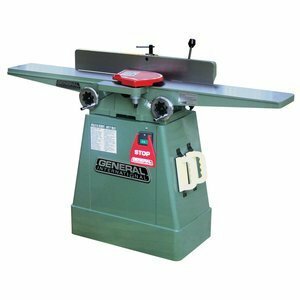 General International 80-100L M1 Jointer with Closed Stand, 6"
Independent in-feed and out-feed table adjustment hand wheels. Large surface, ground cast-iron tables for stability and added support when feeding longer stock. Heavy-duty, three-knife cutter head for clean, fast, superior finish cuts. Large, heavy-duty, center-mounted cast-iron fence with 90Degree and 45Degree positive stops. 4? dust collection outlet included. Built-in rabbeting ledge.